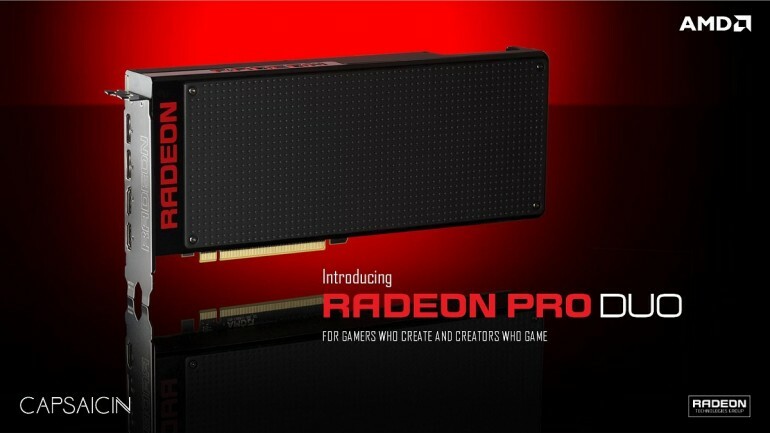 AMD has officially unveiled the full specifications of the recently announced Radeon Pro Duo graphics card. 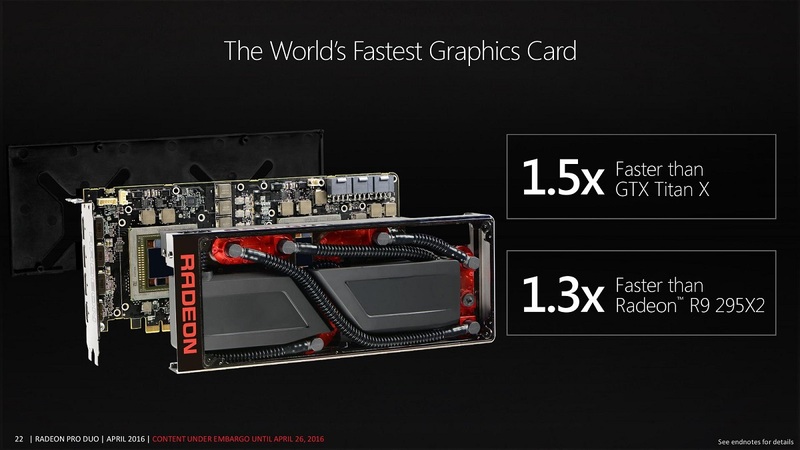 AMD’s upcoming dual-GPU king was first unveiled back in March during the company’s Capsaicin event and is slated to be released by the end of this month for an eye-watering price of US$1,500 (about RM5,870). So, what do you get with a graphics card that costs more than two Sapphire R9 Nano’s? For starters, the Radeon Pro Duo comes with not one, but two 28nm Fiji XT GPUs, which should be rather obvious by now. In addition to that, the graphics card also comes with 8,192 worth of Stream Processors (CUDA core equivalent). 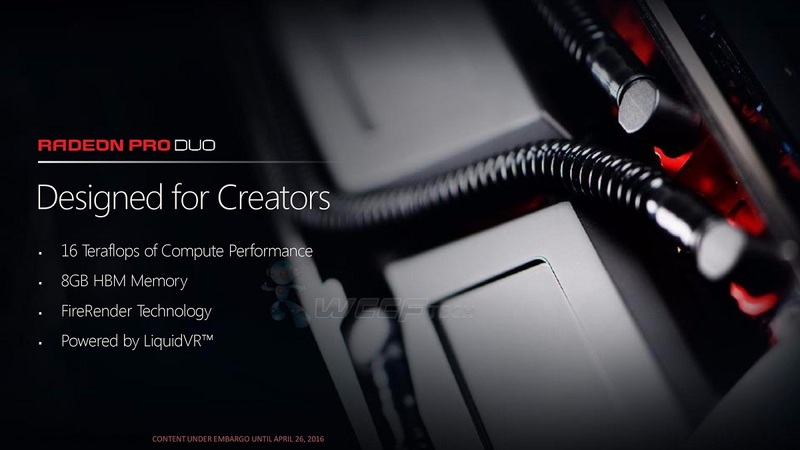 The TMUs (texture mapping unit) and ROPs (render output unit) of the Radeon Pro Duo are said to be 512 and 128 respectively. Core and memory clock of the Radeon Pro Duo is recorded at 100MHz and 500MHz respectively. FP32 performance (single precision floating point) stands at 16.4 TFLOPS – more than twice that of Nvidia’s GTX Titan X (7 TFLOPS). Memory-wise, the Radeon Pro Duo is fitted with 8GB (2x4GB) of HBM1 memory. 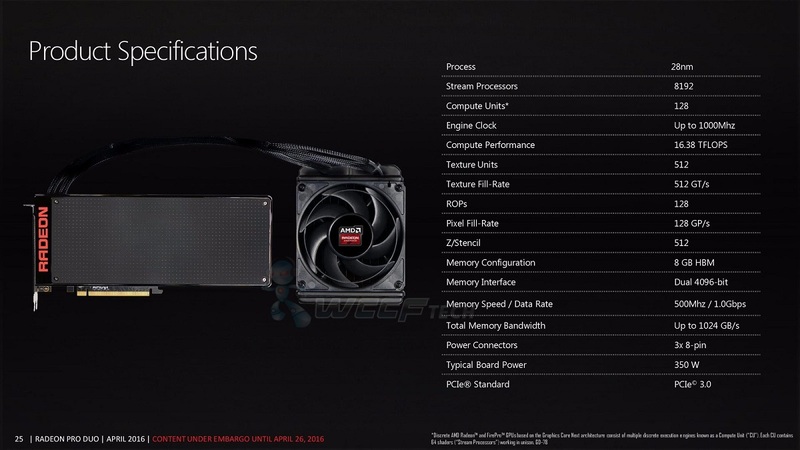 According to AMD, this graphics card has a TDP (thermal design power) of 350W. AMD claims the Radeon Pro Duo to be about 1.3x faster than its predecessor, the Radeon R9 295X2, and up to 1.5x faster than Nvidia’s single-GPU king, the GTX Titan X. Despite this, the high retail price of the Radeon Pro Duo could mean that it may only be affordable to a niche group of gamers and PC enthusiasts.